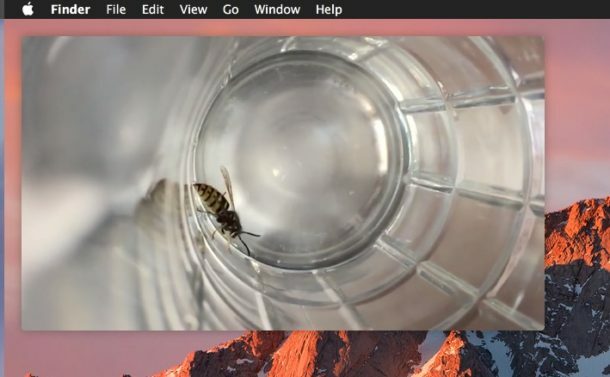 Picture in Picture mode is one of the more useful features available in the latest version of MacOS, essentially it allows you to pop open a little hovering video player that is unobtrusive as it floats over the screen. This is great whether you’re watching a game, tutorial, TV show, or a movie while working (or just pretending to work). Using Picture in Picture mode requires macOS Sierra 10.12 or later, and the feature works with any web-based video playing in Safari, and some third party apps are adopting support as well. If you don’t have a modern version of Mac OS, don’t worry, we’ll point you to an alternative solution for using Picture in Picture too, so you’re not left totally in the dust with this nice feature. The pop-up window has video play/pause controls, and you can also send the video back into the originating browser window. You’ll find the video embed has changed to a message stating “This video is playing in Picture in Picture”, this will remain active until you close the PiP window, or the originating video player window. 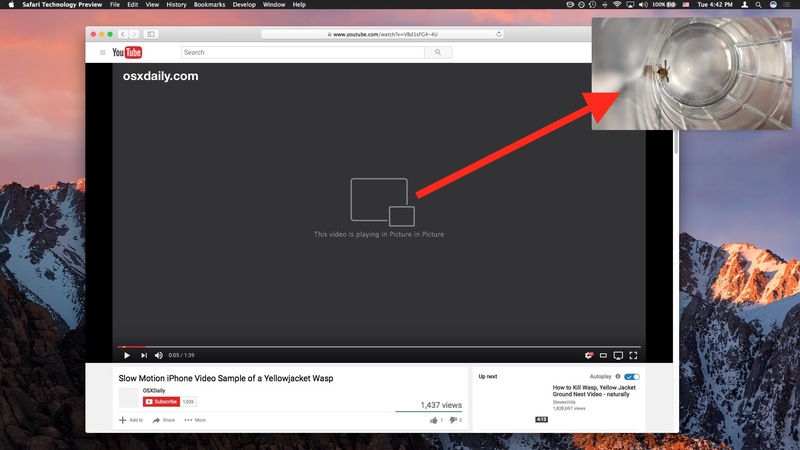 If you close the originating Safari window, the picture-in-picture window of that video will also close. 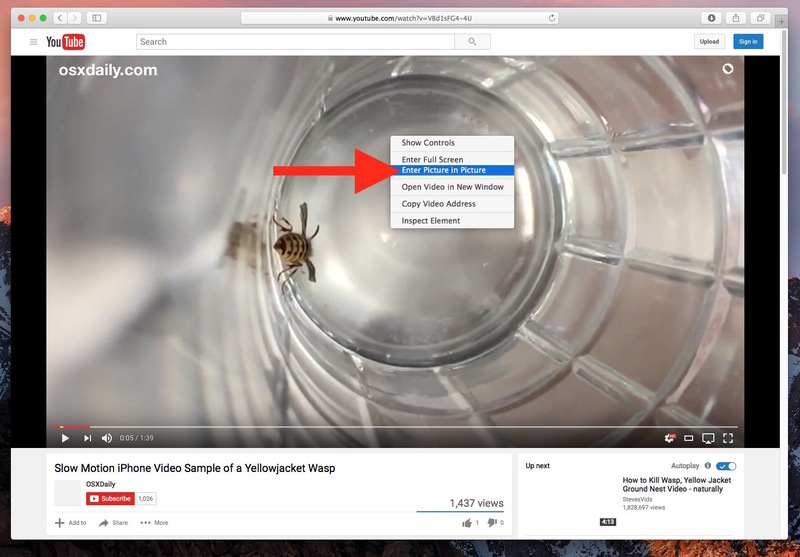 In this walkthrough we are using the embedded video below, it’s a thrilling slow motion video of a wasp crawling around in a glass. Go ahead and start playing the video, then right-click on the video twice (since it’s YouTube it requires the double right-click) and choose “Enter Picture in Picture” mode to immediately try this out yourself. Remember, these features require a modern version of Mac OS, anything beyond 10.12 will have PiP natively. 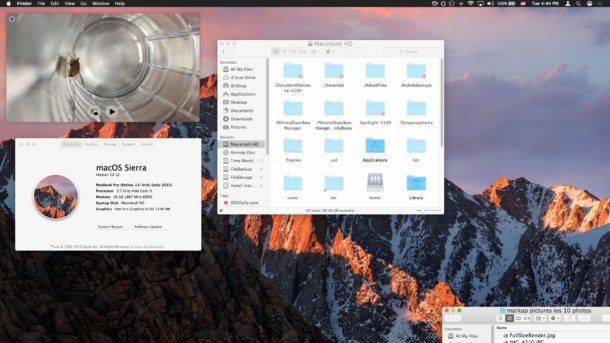 Don’t have a modern version of Mac OS but want to use picture-in-picture mode? Sure thing, check out Helium app to gain a similar PIP feature in other versions of Mac OS X, it works in a similar manner. Finally, Picture in Picture Mode is usable on iPad too and is equally as useful there, if you have an iPad be sure to check that out as well. I can’t do it on my MacBook Pro. Is it works without mouse on touchpad as well? PiP Tool is good too, it’s a Safari extension that allows you to use Picture In Picture on websites that the feature is otherwise not supported. It is helpful for a lot of sites. The new version of Safari that came with latest Mac OS does not recognize YouTube’s HTML 5 format and thus will not play. I cannot make it work, double control click does nothing but bring up the usual menu. How exactly are you double clicking? Mike, you have to do the second right click outside the first message list that comes up. Phil, I have the latest Safari and the wasp video played for me. step 3 – 2 finger click again will shown the PIP menu. Bingle! OK. Yay! I just figured this out, and I’ll say it in plain English for anyone who, like me, just wants to get how to do this without jargon. 1. Go to your video (i.e., YouTube). 2. Hold down Ctrl + click once on the video. 4. If you see that, don’t worry. So far, you’re doing this right. 5. While seeing that and *still* holding down CTRL, click just one more time. I still don’t understand why the automatic icon button isn’t there on the menu on YouTube as suggested online by Apple / outlined here: (https://support.apple.com/en-us/HT206997). But for now, this worked for me. Hope this helps someone in the future! Enjoy.